Autumn colors by day and flower illumination by night with a BBQ lunch thrown in too on this 11.5 hour day trip to Ibaraki and Tochigi prefectures from Tokyo. The itinerary kicks off with a hearty all-you-can-eat BBQ lunch in Hitachinaka city before two dazzling spectacles at Fukuroda Falls in Ibaraki and Ashikaga Flower Park Illumination in Tochigi. Participants are in for a visual treat with a spectacular waterfall set in a gorgeous autumnal background followed by an impressive fusion of light and flowers. With just a handful of departure dates mostly in November, places are limited, so grab your seat now to avoid disappointment! The tour departs Shinjuku at 8:50 heading to Hitachinaka city in Ibaraki, 110km away from Tokyo and situated on the Pacific Ocean, where you will have lunch first to prepare for the day’s activities. This will be an all-you-can-eat BBQ buffet featuring various meats (pork, beef, chicken etc. ), sushi, noodles, salads, rice, a range of side dishes and dessert. You will have just over an hour for lunch. Hopefully well fed and set up for the day, the tour moves onto Fukuroda Falls, one of the top three waterfalls in Japan alongside Kegon Falls in Nikko and Nachi Falls in Wakayama. What makes Fukuroda unique is the four tiered rock sections that the water cascades down giving the waterfall the nickname of “Yodo-no-Taki” (four-step falls). At 120m tall and 73m wide, the dynamic flow of the water is accentuated creating a very impressive spectacle. As if the waterfall wasn’t enough, the surrounding trees should be an explosion of autumnal colors to make the occasion even more special. You will have 70 mins to explore Fukuroda Falls and its surrounding area which is full of walking trails to be at one with nature. 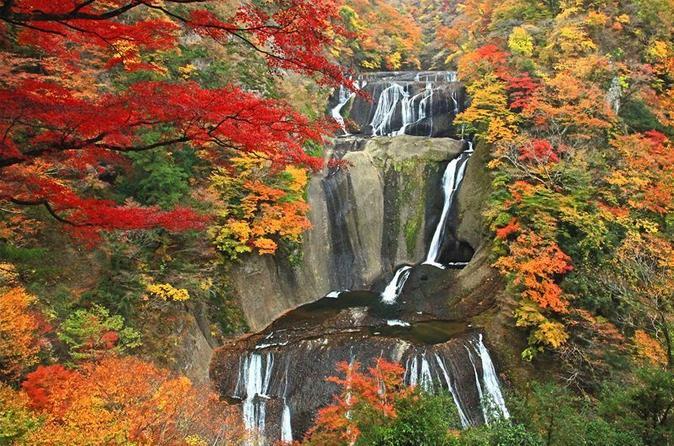 With most of our tour departures in November, the best viewing period for autumn foliage at Fukuroda Falls, this should make for an unforgettable experience. As the day turns into evening, board the bus again to make the journey to Ashikaga Flower Park in Tochigi for the illumination event. This is one of 3 Great Kanto illuminations consisting of over 4 million light bulbs of which the majority are powered by LED. The theme of the illumination is the collaboration between light and flowers with the standout display being the ‘Miraculous Great Wisteria’ where drapes of the purple flowers are lit up and depicts the journey the flowers go through from the first buds, to full bloom and the to the petals wafting to the ground. You will explore the park and its myriad of installations for an hour before heading back to Shinjuku around 20:00~20:30.